Call 1-954-782-5000 or email us about our watch repair services today. 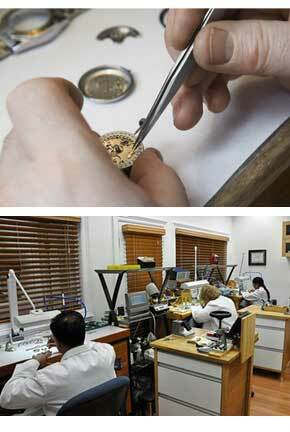 When it’s time for your Swiss timepiece to be repaired or overhauled, J.R. Dunn’s on-site facility is the place to be. We are an Official Rolex Jeweler and fully authorized Rolex repair center. This qualification means that J.R. Dunn only uses original Rolex parts and has the necessary skills and technical know how to maintain and service your watch to exacting Rolex standards. Led by master watchmaker Kamal Peters, our Swiss Watch Repair Center team has a combined experience of nearly 75 years. Kamal Peters is one in just 10 watchmakers in the U.S. to have graduated from the prestigious Breitling Bentley Level 3 Advanced Service Training. And it’s not just Rolex and Breitling watches that are serviced; the multi-certified, degreed master watchmakers give the once-over to and tune-up Corum, Baume & Mercier, Tag Heuer, Patek Philippe, Cartier, IWC, Movado, Hamilton, Piaget, Concord, Chopard and Franc Muller. All repairs are guaranteed for one year. Clients from all over South Florida, particularly Boca Raton and Fort Lauderdale, come to J.R. Dunn Jewelers for the care of their watches and jewelry repairs because it’s a name they trust. The Swiss Watch Repair Center is equipped with state-of-the-art tools and machines, from bench lighting to special air conditioning filters and dust collecting mats at the door. Polishing and other “dirty” processes are done in a separate area. One your overhaul is complete, your watch will be reassembled and will look pristine, almost like the day you got it!